Reasons for Fasting: To break fast food addictions, lose additional weight, aid in healing, and give my digestive system a break! Intended Length of Fast: 14 days, but we’ll see if I can keep up the momentum and go and bit longer! Proposed Fasting Method: Two days of coffee and teas, with ‘dinner’ being a stewed and strained vegetable broth, then primarily water and teas. Past Fasting Experience: Five day water fasts in the past. Looking to keep the momentum and go for two solid weeks, at minimum. Present Diet: Trying to eat healthy, exercise 3x a week, but I often succumb to the ease of delivery food. Limitations: Well, I work 40 hours a week and my graduate night classes begin next Tuesday. I also have an interview for a second job next week (part time, 5 hours a week). I know it would be ‘easier’ to wait for my life to calm down, but frankly- I don’t see that happening. I wish to get into the habit of letting my body take a rest from digestion at least twice a year- and if you keep waiting for the ‘right’ time, I feel like it will never happen. So it’s the end of day one- one of the hardest days for me! I know if I can get the momentum going and reach the morning of the fourth day, I’ll be well on my way. It has been really difficult to eat well this summer- I got married and the stress of planning and organizing just really got to me. I ate whatever was easiest, which unfortunately was takeout! I really need to break myself out of this terrible habit. When it comes to fixing dinners and lunches for my husband- I use the very best ingredients, but when it comes to my own health, I never hesitate to use the very worst! I hope to lose some of the additional weight and toxins that I’m sure have built up in my system in the past few months. Any support and advice would be greatly appreciated! Even on a water fast I have a juicer handy. 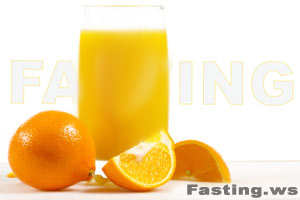 I never push my body or mind hard on water fasting and if I have to I change to juice fasting. Water fasting off a toxic diet is not wise. Thanks so much for the advice! I have a juicer on hand in case of emergency, and I made sure to do a 2 day detox a week ago so the transition wouldn’t be as difficult. It’s day Two, I’m feeling good, and I slept well. No headaches thankfully- I had some pretty serious ones during detox last week, but it looks like they’re out of my system now. Weight is 161.5lb this morning. I feel like I lose a lot of weight during my sleep for some reason- I measured myself right before bed- 164lb. This morning.. 161.5. Well it’s day three- an important one for me. If I make it past this one I’m sure I’ll be well on my way. I had a small fresh fruit smoothie yesterday to keep me on track. I’m actually feeling fine today- it’s like I have a very low level humm of hunger in the background, but it’s not so bad. Feels like the 4th or 5th day- usually #3 is hardest for me but I already feel settled. I think it has a lot to do with the 2 day detox fast I did a little while ago. I was 160.5 I think this morning, so I’m progressing. I do however have my first day of classes tonight, so it will be a ten hour day, plus 3 hours of class. If I can make it through that- I think I’ll be able to continue!